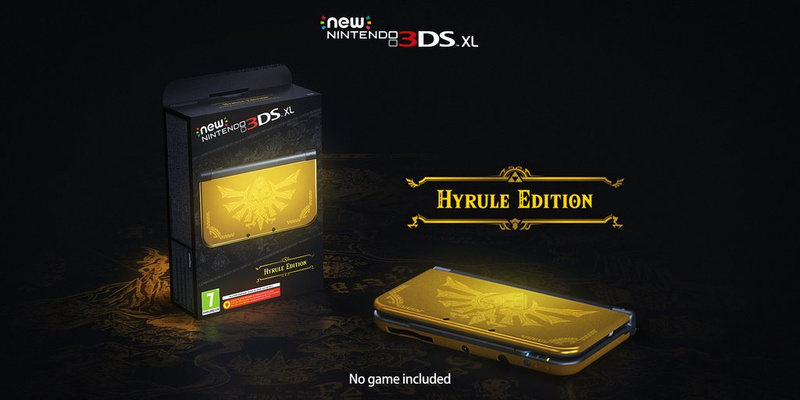 Should you be unsure about investing in Nintendo's latest 3DS hardware then you might find the decision is made for you once you clap eyes on this newly-announced Hyrule Edition New 3DS XL, launching in March alongside Hyrule Warriors Legends. The unit - which puzzlingly doesn't include a copy of the game - will launch in Europe on March 24th. The game is available as a standalone purchase or as part of a Limited Edition bundle, which comes with a watch that's a replica of Linkle's signature compass. Oh FFS. I have every UK release Zelda themed console... And what is it with Nintendo putting the emblem of things the wrong bloody way round! kind of a con releasing it without the game as well considering its a 'Hyrule' edition so common sense would be to include the Hyrule Warriors game this is releasing next too! 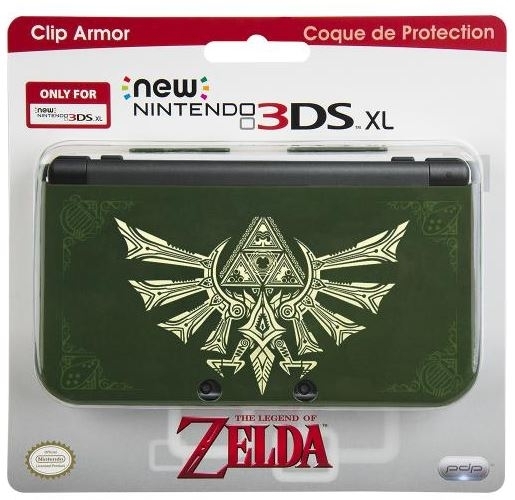 I think this is the best looking Zelda 3DS yet. Won't be buying though - special editions are just far too common to me now they no longer feel special. @tonybrightside How is it a con to give gamers options? If the game were included it wouldn't be free. Instead the MSRP would be higher. There are a ton of Zelda fans who have no desire to buy or play Hyrule Warriors Legends at all, so it's GOOD it's not part of the package. @Achoo it's annoying as it's taking advantage of fans who collect Zelda items, in the space of 2 years there has been 3 'limited edition' Zelda 3DSXLs that are all almost identical look wise. The ALBW, MM and now HE are all practically the same design adding nothing new but expecting collectors to fork £200+ for a practical identical console. @scamander it's a con for the exact reason I just put, this is near identical to the other 2 Zelda limited edition consoles that have released in the past 2 years. If the design was drastically different it wouldn't be as bad but it isn't. That system has been available here in Canada as a ebgames exclusive for at least 5 months or more now, definitely is tempting to buy one! Limited Edition bundle, which comes with a watch that's a replica of Linkle's signature compass. Who are these people that play Zelda yet want a toy watch that is a replica of a compass; in other words it is not a compass but when you wear it, if it fits, you can pretend it is. I guess it the same people that buy Amiibos. Any chance of a Non-XL model? Nintendo never includes games in their limited editions anymore, why is it puzzling that this one doesn't? I have the red N3DSXL and can't really justify another one. Up until now, I have spent my time drooling over the Monster Hunter 4 edition, but now I shall drool over this one. I also really want a non-XL New 3ds, but again, just cannot justify additional 3DSs. My wallet refuses to comply with my desires. Nintendo can you maybe just focus on releasing more games please since we have like 10 different 3ds consoles already ? Thanks, lots of luv , everybody. I guess they shipped the UK all the excess units for NA. This is my chance to get a gold New 3DS so happy! Very tempted now can't decide between this and the American one for Fates. It's beautiful. I still think I'll just get a white non XL if I ever decide to upgrade. I like the face plates. Need to stop spending money for a while though. Definitely agree that they should flip the image around.. Very nice! I'd pick the Fire Emblem one over this though. @tonybrightside Eh... that has nothing to do with the game being included or not. If you think the design is too samey don't buy it. Problem solved. 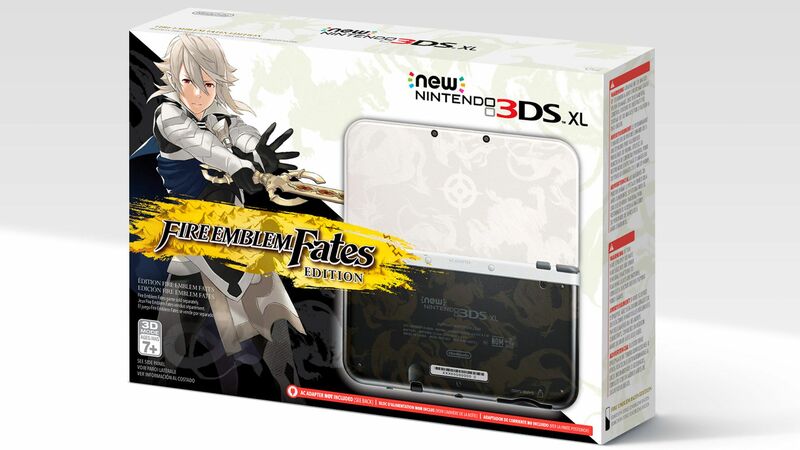 @The_BAAD_Man ; Agreed, I really hope EU gets the FE Fates-Edition as well! Finally, a New 3DS XL that I wouldn't mind trading in my trusty red/black 3DS XL for. And it's only in Europe. I have this one in NA from when it was a GameStop exclusive over the past holiday season. It's quite nice... the casing, while glossy, doesn't show off fingerprints or smudges nearly as much as the other models. I think it is a mixture of the color shade and it also feels like it was made out of slightly different materials.